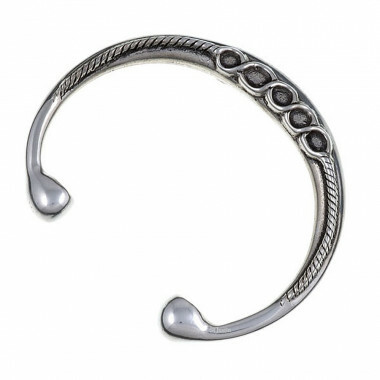 St Justin tin Torque Bracelet with Celtic symbols. According to classing writers, the Celts used to wear torques during battles. The torques (necklaces and bracelets) have been discovered in Great Britain and Europe. They were probably worn by high-ranking warriors such as tribal chiefs and leaders. Width: 8 mm (medium) - Inner diameter: 62 mm. This bracelet is delivered in a velvet pouch.